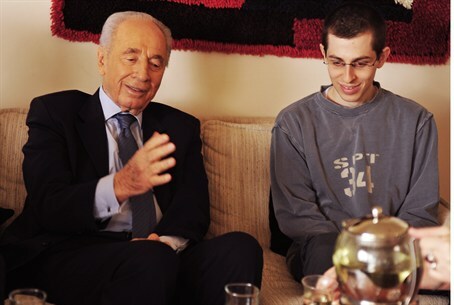 President Shimon Peres visits the Shalit residence; Shalits thank president and prime minister for their efforts to free their son. The Shalits waited for Peres at the entrance to their home and shook hands with him heartily. The president then hugged Gilad and said, "You have no idea how excited I am to meet you here in your home, alive, healthy and whole." The president said that "the entire nation, from the tender ages to the veteran citizens, was mobilized to bring you back. It was a mobilization from depths of love and devotion and your homecoming is an amazing personal and national event." Peres told the Shalits that he is "glad that they were stubborn and did not let up for a moment." Gilad Shalit said, "Thank you for all of the support and assistance you gave to my family." His father Noam said, "We appreciate and thank you for all that you did during all these years, we know that you were involved behind the scenes and we needed all the help we could get." Aviva Shalit said that her son was "a true hero." She thanked Peres, but also thanked Prime Minister Binyamin Netanyahu, "who took a courageous decision to bring Gilad back to life and to prove that mutual commitment are not just hollow words but a value and I believe that the entire nation of Israel thanks you for this."